This Novomatic slot game will shoot you with wins at point-bank! It’s a bank robbery-themed slot game with five reels, twenty-five paylines and an RTP of 95%. There have been many high-profile bank robberies throughout history. Millions and billions have been stolen by robbers over the years! Some of the bank robbers get caught and some of them don’t! In many of the most famous (and biggest) bank robberies of all time, much of the stolen cash, gold and jewels is still missing to this day. Some mysteries are destined to go unsolved and some people are destined to have all the cash! If you think you’re one of the latter, then try out Bank Raid from Novomatic. The Return to Player percentage is average for a slot game and this game is pretty fun to play. The theme of this slot game is quite unique for a Novomatic game. Having said that, all of the favourite symbols are there, including card value symbols. This game also comes with all of Novomatic’s signature features such as the music, the sound effects, autoplay mode, gamble game and Wilds and Scatters. Novomatic’s games are all quite similar in this regard, but their formula works so why change it? It’s why players enjoy their slot games so much! There’s a wealth of symbols in this bank robbery-themed slot game! The classic card value symbols are all there (the 10, Jack, Queen, King and Ace) but they’re uniquely adapted for this game. The 10 has a police flashlight; the Jack has a cop’s hat; the Q’s tail is a cat’s paw tool; the King is in handcuffs and the Ace has the robber’s hat on his head. These symbols, like all of the others in the game, pay from three or more matches on a payline. They are also the symbols that have the smallest payouts. Bigger payouts come from the themed symbols. These include: the police hat and whistle; the newspaper; the golden bullions; the bag of cash and coins; the bank itself; the robber and the police car. The twenty-five paylines aren’t fixed so you don’t have to have them all active if you don’t want to. You can also adjust your bet per line from 0.01 to 2.00 so you don’t have to break the bank to be able to play this game! Whenever you get three or more symbols that match to land on one of the activated paylines (on consecutive reels from left to right), you’ll get the corresponding payout as displayed on the paytable. This will update with your bet, so the more you bet per line, the bigger the payouts will be. Payouts can be gambled (when not in autoplay mode) for a 50/50 chance of doubling/losing it. This is a video slot so the symbols come alive when you get a win! As is tradition in a Novomatic slot game, there are a couple of symbols which are special and can help you get wins and Free Spins! In Bank Raid, these symbols are the robber and the police car. The robber is the Wild symbol. He can pretend to be any of the other symbols (except for the police car) when he lands in a position that will help complete a combination and get a payout. He also pays on his own like a normal symbol. The police car, on the other hand, is the Scatter symbol. This symbol doesn’t follow the rules! The police car can pay from any position! Scatter pays aren’t the only thing that this police car can do for you. It can also trigger 10 Free Games. 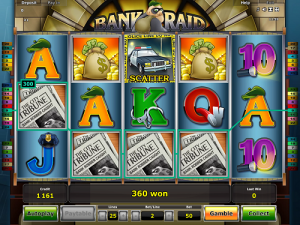 Land 3, 4 or 5 police car symbols on any three positions on the reels of Bank Raid and you’ll trigger the Free Games. When you’re playing these Free Games, the Wild symbol (the robber) gains the power of expansion! It can expand to fill an entire reel (when it lands on one in view) and give even more wins. You can also win more Free Games during the Free Games. Novomatic is an online casino game developer that you can really bank on. Their games are always high-quality and they’re always fun to play. They might not be the most advanced games in terms of technology or graphic design – but they have a recipe that comes great every time! You’ll never get bored playing one of their great games. Gamers who already enjoy playing American Gangster, Cops n Robbers, Cops n Robbers Millionaires Row or Sharky will like Bank Raid from Novomatic.